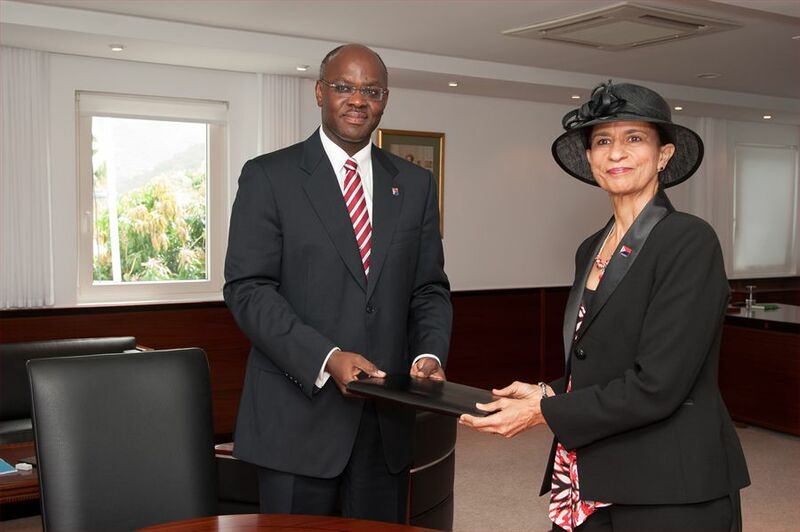 Harbour View – On May 21, 2012, His Excellency the Governor of Sint Maarten, drs. E.B. Holiday, officiated the appointment and administered the oath of office to the Ministers and the Minister Plenipotentiary of the new cabinet. 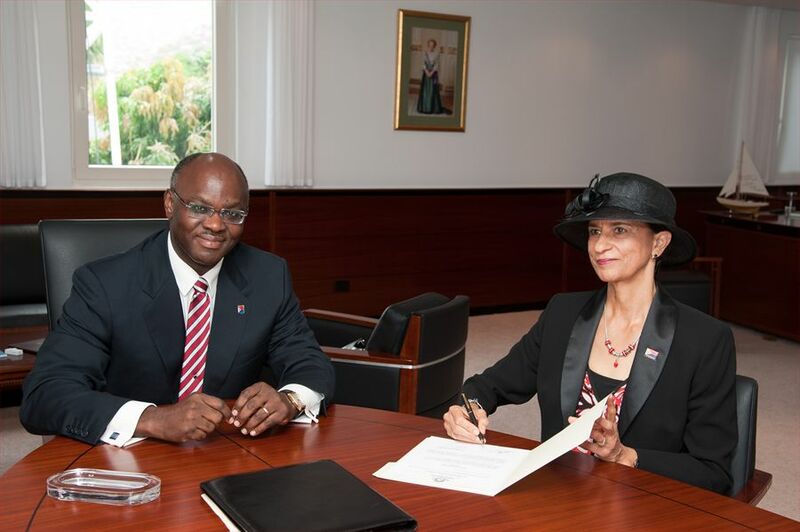 Mrs. Doran-York, who has been appointed in the position of deputy of the Minister Plenipotentiary, will take the oath before the Governor on May 22, 2012. The NA/DP/I3 government will execute the governing accord “Working for the People”, as agreed upon by the coalition partners National Alliance, Democratic Party and the three independent Members of Parliament, Frans Richardson, Patrick Illidge and Romain Laville. 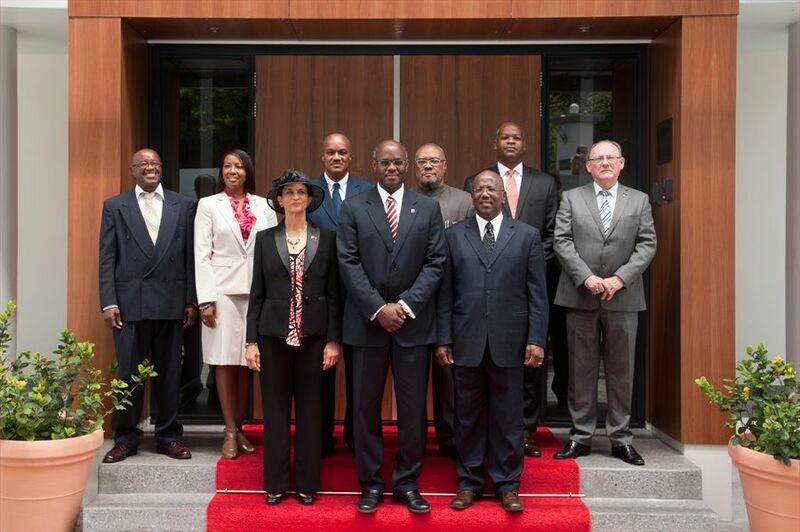 “Today’s appointment and swearing in ceremony marks the transfer of executive responsibility for the governance of our island Sint Maarten from one team of ministers to a new team of ministers. This transfer is a first and as such a new and educational page in the history of our parliamentary democracy. It is, following a period of uncertainty, the culmination of the official formation process of the past week and half. During that period I consulted with various persons and named and worked with “formateurs” Mr. William Marlin and Mrs. Sarah Wescot-Williams. Both formateurs informed me on the formation of the government through the nomination of ministers, through the results of the judicial and security vetting of the nominated ministers and through the governing program entitled “working for the people”. For that I hereby express my appreciation for the work performed by both of you. 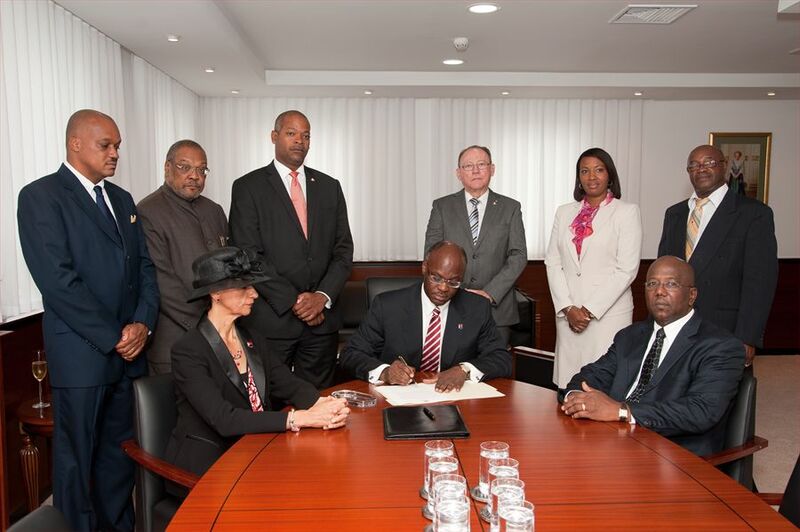 Having reviewed the information provided I convened today’s ceremony to administer the appointment and swearing in of the new team of ministers, in keeping with the Constitution of St. Maarten. 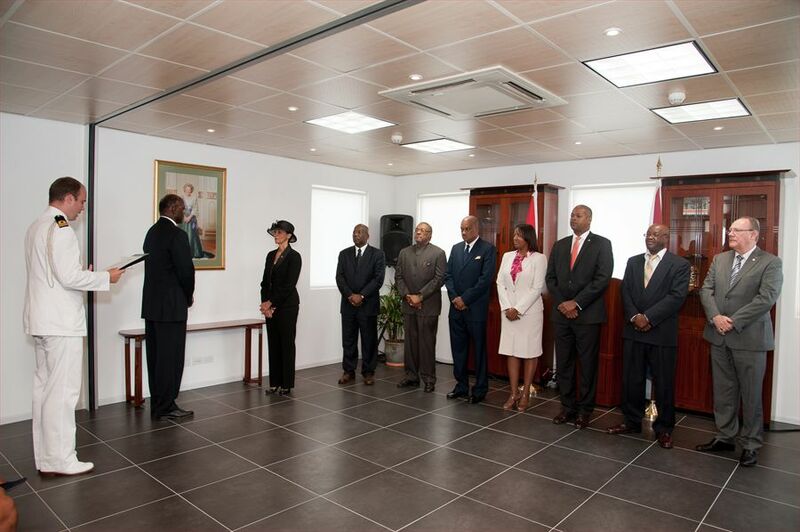 As such, each of you, in accepting your respective functions as ministers have taken the oath of office, as prescribe by the highest national law of Sint Maarten. 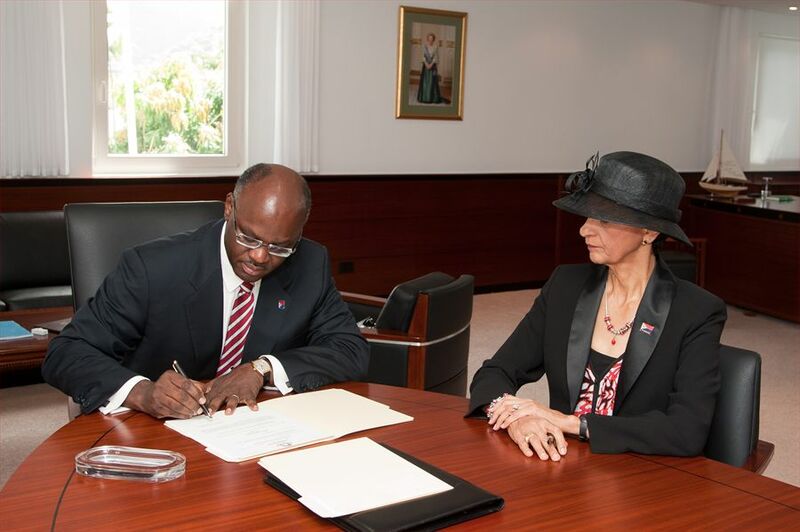 Accepting the function of minister through the taking of the oath is a solemn expression of your commitment to perform your function with integrity, it is your pledge of allegiance to the Queen and the Kingdom Charter, it is your individual declaration to always uphold the Constitution of Sint Maarten and to always dedicate yourself to foster the wellbeing of the People of Sint Maarten. In that regard there rests on you individually as ministers and jointly as Council of Ministers a great responsibility. 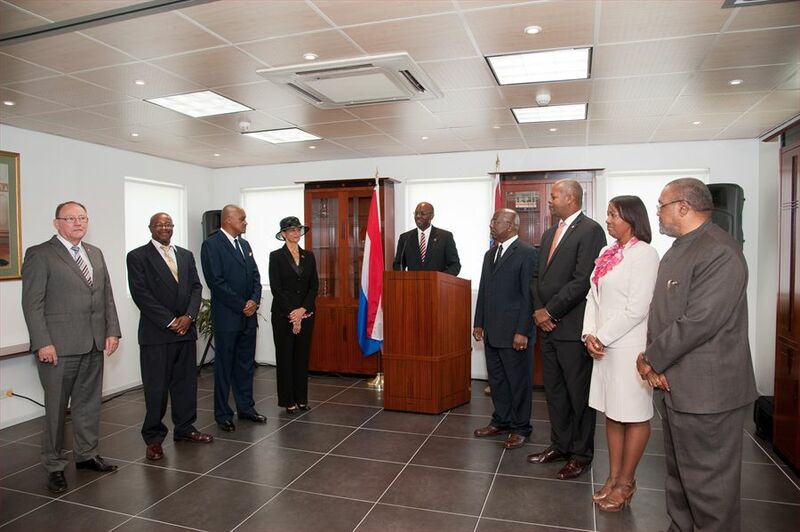 Through your oath you have accepted the obligation to serve all the people of Sint Maarten. This based on the principles of democracy, on the rule of law, on the principle of the division of powers, and on respect for the fundamental rights and freedoms of all persons. Today just over a year and a half since obtaining the status of country this new team has been entrusted with the task of governing the affairs of the people. And in keeping with the title of your governing accord, the people will be looking to you for education, security, social and economic development and more. It is my hope and trust that as you continue the march, where your predecessors left off, that you will through the application of the principles of good governance, answer the call towards the further overall and balanced development of our island nation. Your decisions will have lasting influences on the lives of the people of Sint Maarten. Thus as you deliberate on taking action on the matters before you during your governing period, I wish you wisdom, severally and jointly, in the conduct of your responsibilities as you seek to serve the people of Sint Maarten.